Short Description A universal text manipulator managed via context menu. See screenshot attached. There are many text editors out there, and not all of them have the text-manipulation functions that you always want or need. TextWorx is designed to give you a slew of text-manipulation functions at your disposal for whatever text editor you wish to work with. It has a universal context menu and custom toolbar/s that you open with a hotkey. First select your text, then call the menu, then the function that you wish to run against that text. I've longed to share it for a very long time and have been working on and off with it for over 8 years. Take a look at the online help (although it comes with the same help as a local chm file); there are screenshots, credits and version history there. For example, if you want to encase a word in double-quotes, just select the text, then select the function from the menu. To remove double-quotes, hold shift when you select the function. To encase each line in double-quotes, hold control when you select the function. To remove double-quotes from each line, hold control+shift when you select the function. Universal context menu for text editors. Modify single words, or multiple lines. Easily comment and uncomment code. Quickly create html ordered/unordered lists and inserting html tags. Number and renumber lines (complete with padding and custom number parameters). Insert preset text snippets and characters. Insert the date in multiple fashions. Search and Replace multiple criteria - example: replace all State abbeviations with their names (and vice versa). Just extract the contents of the zip file and run the executable. To use this program, first select some text, then push the hotkey, then select your text-manipulation routine. The text is transformed and replaced right in your editor. Just delete all the files. This seems very interesting and useful, I am waiting for the download link. Agreed, looks quite useful. Looking forward to it. This reminds me of Boxer Software's Text Monkey (complete feature list here), and its alternatives, see e.g. the alternativeTo listing. I particularly liked WOTS Clippy, but both programs are old now, and the author of Clippy has disappeared from the Web. However, your program has different features than these, despite overlap. Fellas, I'm almost ready for posting a link. There are a few more things to work out before I do so, but I'll be able to do it this week. The big thing about this method of text manipulation is that it doesn't have a gui window of it's own. AND all of the commands in the menu can also be put into a toolbar - you get to pick and choose what commands to put in the toolbar, and you can have multiple toolbars to choose from, all that interact with the text editor. Wow, I've never seen Text Monkey before! But after I post mine, I'll be open to requests. Okay, I've uploaded a working version. I'm still working on it. Most things work pretty well, but there are a few problems that I still need to iron out. Also, I'm working on the documentation. If you want to add another custom toolbar, quit TextWorx and edit the textworx.ini file. In the [toolbar] section, add 1 to "maxcustom" - it should be the total number of toolbars. Then, the ini key name for the toolbar should be something like 101 or 102 depending on how many you have. I plan to add an options window to the program that will do this for you. Right now there are a lot of options that can be edited only by changing the ini file; but wait for the documentation. PasteHyperlink is for editing html. Copy a url to your clipboard, then select some text that you want to become the link text. TextWorx will copy text, wrap it in link tags and add the href for you. For the Open with Notepad items in the tools menu, you have to make sure the full path to your notedpad or text editor is in the ini file. I'll add an options panel to insert it correctly in the ini file. But I'm just mentioning it here in case you are wondering and are interested in tinkering. Yes, the main menu can be customized as well to display favourite commands. I might make the entire menu customizable, but that will have to come later. When I get the options panel working, at least you'll be able to add favourites to the main menu. Version 0.4 can now be had. Lots of fixes and is working much better now. Trying it out in the forum's editor pane (while typing this message) it wouldn't convert upper/lower/title/sentence case or encase a selection, I'm not sure that's by design? (using Firefox 64.0 (64bit)). The same is the case in Notepad++ (v7.5.9, 32 bit). This is most likely caused by that error. Ath - try again, please. I uploaded a new version. I'm still learning how to get around the wordpress thing; maybe I did something wrong there. For the menu error - wow, that sort of erases half the rest of the menu, and destroys the toolbar. I'm working on fixing that. But the case conversion should work now. My dev config file is full so it has everything; I have to work on the startup version now. Hold tight, please! Don't give up on me! For now, put this in textworx.ini and restart textworx. It will fix the menu and the toolbar. Version 0.6 is ready. I fixed all the startup issues. Best to start with a fresh setup this time. try again, please. I uploaded a new version. Replacements work like a charm, very useful, especially as I'm working/developing in web browsers for a living, that don't have much smarts in text manipulation (and I sometimes accidentally switch on cAPS lOCK...), where re-typing is the usual way of fixing things. You might want to package it a bit different before uploading to your (WP) site, there are 5 zipfiles in this TextWorx release-zip, and I had to manually select the latest to extract the files from. A single TextWorx.zip file holding only the latest application-files should suffice, IMHO. Convert / 'Dec to Hex | Hex to Dec' : does only Dec to Hex (20 -> 14 -> E -> <error>), maybe a prefix (#/$/0x) should be added on the Hex result? Hm, it seems all those dual-conversions only do the 'left side' of the conversion, all work in progress, I presume? This is what I tested so far. Hmmm... My zipfile that I upload does not contain any zipfiles. I think maybe WP is adding the newer one to the old one or something. I'm still trying to get a handle on this WP stuff. Maybe I have to remove the package completely in WP? Oh yes! That would be fun, too! Yeah, I know some commands are in more than one menu; I actually did that on purpose. The dual-conversions all work in the version I'm working at the moment - in the beta you have there was an issue detecting the shift modifier. I'll test the uri encode again. I think I might have already fixed it. Ha - it does have two exit entries! Didn't realize that. Escape for the panels - yeah, I don't think that works in any of them. I'll look into adding that. The cancel button should work, though (but I know how you feel with the escape button). Maybe I have to remove the package completely in WP? Some functions don't have a reverse because it doesn't matter - like the "Reverse" function, or other things that can't be reversed. Sometimes you may want to work the effect twice, so therefore you have the option of forward again, or to reverse if you like - like the Base64 encoding, for example, where you said sometimes you would need to do it twice. So, you hold the modifier keys (shift, or control, or shift+control) when you click on the command - unless you are using a dialogue panel, in which case you hold the modifier key when you click the Accept button. Okay, I've uploaded a new version. The modifier keys all work now. Some of the menu names were wrong before, but I think I've fixed them all. There were some functions that didn't work on lines or would not reverse because the modifier key wasn't being detected. This time, I deleted all the former zip files before I added the new one. Also, you can add favourite items to the main menu by putting this in the textworx.ini file. I'm working on an options panel to let you choose, but until I get that done, I might give a list of commands in the documentation. The ini key is the first number on the left of the = sign. The command is the second number. maxcustom is the number of commands to be shown in the menu; the order is set by the number sequence, not by the position of the ini key. I still have to add the base64 encode for you, Ath. One of those apps that integrate my obsessions. convert, transform and automate. Wonderful. I keep trying. I observ some modules don't go well for me because I have desactivated the UAC features. It is working great in most things I use. I noticed it works well on web chat boxes in a browser. Is it possible to think about BBCode? Or better an personal INI file to allow people to customize the things they would like? There is some customization possible - not for the submenus, but you can add specific commands to the main menu - I showed how to do that above. I am working on an options menu that will allow you to do that. The documentation, as soon as it's all together, will also explain some of this. There's quite a bit more to it than what appears in the menu. Right now it's all hidden in the ini settings. BBC Code, yeah, we can do that, too. Really, we could do anything; it's just a matter of time spent and understanding what to do to the text. I'll put BBC Code on my todo list. In the next update I'll release some fixes to a few things that are not quite working right. Hold tight! I appreciate y'all's interest! clipspeed - the length of time to wait for text to appear on the clipboard - adjust this by no more than 1.0 at a time. windelay - the time to wait (in milliseconds) for windows to become active before interacting with them. sendmode - the method used to set the text back to the original window. 4 is default, but there is also 1, 2 and 3. I think 4 should always work, though. 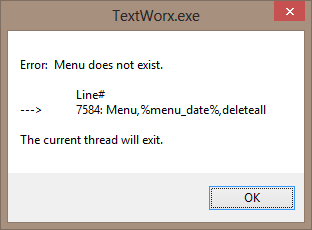 Error: Menu does not exist. This happens under Windows 8 x64. Is there a way to change the default shortcut keys?